» Middle Relief: Who Is the Best Pitcher in Baseball? Seems like a straightforward question, right? Flip through the stats to find the league leaders. Use your eyes if you’re someone who does that well. imagine how tough it is for the rest of us to get it right. So many people holding so many different opinions on the subject underscores how tough it still is to evaluate pitching, even with a million tools at our disposal. It’s also a nod toward the fleeting nature of pitching success, and how quickly opinions can change. Sometimes radically. Google “arguably the best pitcher in baseball” and you get results for the following pitchers, to name just a few. How about a Twitter poll? The question “Who would you say is the best starting pitcher in MLB right now?” yielded the following results: Justin Verlander, Strasburg, Kershaw, Dickey, Cain, Halladay, Zack Greinke, Johnny Cueto, Sale, CC Sabathia, David Price, James McDonald, and Felix Hernandez, in that order. How do you get such a broad scope of results? Leaving aside simple fan bias, there are several likely contributing factors. Signature Moments: You may have heard a thing or two about the rash of no-hitters over the past few years. When Edwin Jackson walks eight batters in his no-no, or Philip Humber comes out of nowhere to toss a perfect game, we don’t elevate them to the rank of elite pitchers. But when an already-dominant pitcher like Cain reaches the pinnacle of his game, it’s easy to let our thoughts run wild. Recency Effect: Three months ago, no one in their right mind would have nominated Dickey for any title other than MLB’s best knuckleball pitcher (read: more or less MLB’s only knuckleball pitcher) and top podcast guest. Then he caught fire, firing 44⅔ straight scoreless innings. Not just scoreless innings — borderline unhittable ones. In one three-start stretch, Dickey fanned 33 batters, walked four, and allowed just six hits over 25⅔ innings. We human beings are wired to overemphasize recent events. Often that works to our detriment. But with pitchers, it can actually be a pragmatic approach. One elbow twinge and the career of a great pitcher can be altered forever. Variety of Stats: So you think you can find baseball’s best pitcher with a quick look at the numbers? Good luck with that. Going by ERA, the best pitcher in baseball is Brandon Beachy, who just had Tommy John surgery. Are you a FIP fan? Greinke and Gio Gonzalez lead the pack there. What about xFIP? In that case, Strasburg rules. Win Probability Added? Verlander. Wins Above Replacement? That’s also Verlander — though even then, the rest of the WAR top five looks very different depending on whether you use FanGraphs’ version of the stat, or Baseball-Reference.com’s. most of the time, anyway. FanGraphs tracks xFIP-, a stat that works like ERA+ in comparing a pitcher’s results to league average while also considering park factors. But xFIP- has the added advantage of stripping out the effects of defense and luck to focus on the factors a pitcher most directly controls, such as strikeouts, walks, and ground-ball rate. By that standard, Greinke has been the best pitcher in the game this year. Time Frame: By focusing on who’s best right now, we can lose track of sample-size pitfalls. Dallas Braden may have been the best on the day he tossed his unlikely perfect game, but we also understand that one start doesn’t tell us nearly enough. So what is enough? The 15 or so starts most healthy starting pitchers have hurled this year? The 30-35 starts a pitcher racks up over the course of a year? Two years? Three years? More? Generally speaking, the larger the sample size, the better we can eliminate random noise from our analysis and find the pitcher with the best body of work. On the other hand, if we use, say, five-year samples, we might gloss over a very real drop in more recent performance, one that could dramatically affect how top pitchers stack up against each other. Eye Test: Introducing too much subjectivity into the discussion invites all kinds of problems. Say we want to evaluate a pitcher based on the nastiness of his stuff. How much credit do we give Verlander for threatening 100 mph into the eighth and ninth innings of some games? How do we treat Dickey, whom we could actually make a strong case for as baseball’s best pitcher when his knuckler’s on, but becomes a piñata when the pitch doesn’t spin the right way? And what on earth do you do when Kershaw throws a curveball like this? None of this covers the toughest nut to crack of all: strength of schedule. If we simply rank SOS based on the aggregate records of teams that a pitcher faces, we risk lumping in teams’ pitching and fielding strength with that of their hitters (the only factor that should matter here). Drilling down further, we can use something like opponents’ OPS, which Baseball Prospectus tracks. If we do that, though, we’re not considering the ballparks in which a pitcher pitches, nor the quality of the defense behind him. We might also miss more granular data, such as the handedness of a batter (certain pitchers have wide splits and thus might greatly benefit from a lefty- or righty-heavy lineup). And that’s before we get really nerdy about it, examining variables such as the pitch-type tendencies of individual hitters, and how a changeup- or cutter-throwing specialist might fare against those particular teams. Plus, of course, we can get back to the problem of sample size: The Pirates’ Charlie Morton leads all starters with a .789 opponents’ OPS this year (minimum 50 IP); how much should his nine (pre-Tommy John) 2012 starts and the competition he faced factor into how we evaluate his season? The best we can do is combine all these factors (and more) and take a good-faith, educated stab at it. Greinke leads the majors in a couple of major pitching categories, but he also pitched less than a full season last year and had a marked change in his performance upon his arrival in Milwaukee, which suggests he might be fattening up on weak NL Central competition. Strasburg was cited by many for having the best raw stuff in the game; he also leads all starting pitchers in ERA, FIP, xFIP, SIERA, WHIP, and strikeouts per nine innings since crashing the majors. And yet, Strasburg’s never even made it through eight innings in a start, a must if you’re going to get labeled best in baseball. Granted, this is partly the fault of Strasburg’s employers, who’re trying to cap Strasburg’s innings this year and thus pulling him from some games he could probably finish. Big 2011 performers like Dickey, Gonzalez, Cueto, Sale, and McDonald lack the combination of prolonged track records of success and current dominance needed to win the title. Pitchers like Sabathia and Price are likely underrated given the beastly competition they must face in the AL East every year, but even after adjusting for strength of schedule, neither quite shows the consistent excellence of the best of the best. King Felix has the best nickname, but he’s probably never been the best pitcher in the league in a given season, despite the awards, even though he’s been top-five multiple times. You could say the same about Jered Weaver. Cole Hamels might have a shot at it, but for the fact that his three-year résumé’s the third-best on his own team. Cliff Lee tops all pitchers in xFIP- dating back to the start of the 2010 season, but his results are down a bit this year. No, we’re not talking about his won-lost record, which is so fluky it’d be tragic, if anyone who paid attention still gave two shits about a won-lost record. 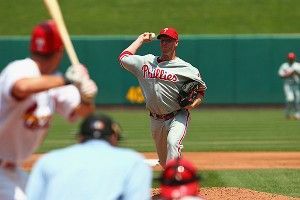 Halladay would’ve won this title a couple years ago, but age and injuries have knocked him down a peg. So after much consternation, we’ll go with baseball’s leader in innings pitched and WAR dating back to 2011, 2010, and 2009, a strikeout pitcher (better than a K per inning since ’09) with good control who keeps the ball in the park, goes deep into games, rarely gets hurt, and often gets better as the game goes along. It’s Justin Verlander’s crown for now. But he’s got a hell of a lot of competition.